As I told Ruthie then, I'm not sure I'm much help, because our house is overflowing with dishes. 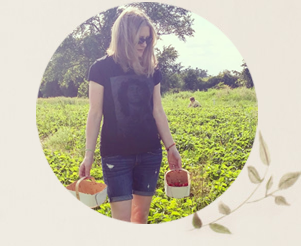 But, although (like most women) I'm working hard to get organized, I do believe in making a place for the things you love. Many of my dishes are from my mom and dad and I wouldn't think of parting with them. The others I have no excuse for. But I'm keeping 'em anyway! Sooo...here's what I've done with my dishes so far. These are our main kitchen cupboards, with everyday dishes in the larger cupboard. 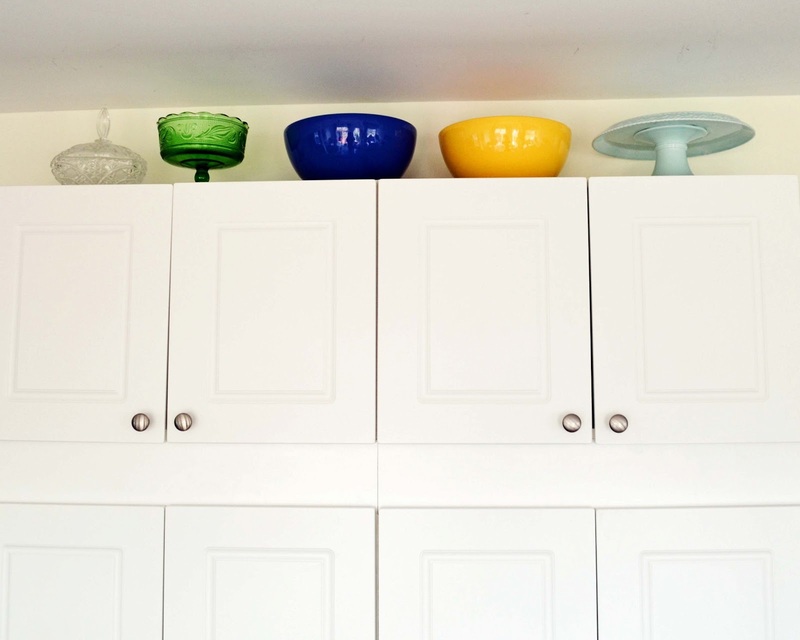 The smaller cupboard on the right holds dessert dishes, espresso cups and a couple of random teapots. We also squeezed in the little dishes we use to hold soy sauce for sushi. Believe me, I have looked everywhere for space. Sometimes that means looking up. 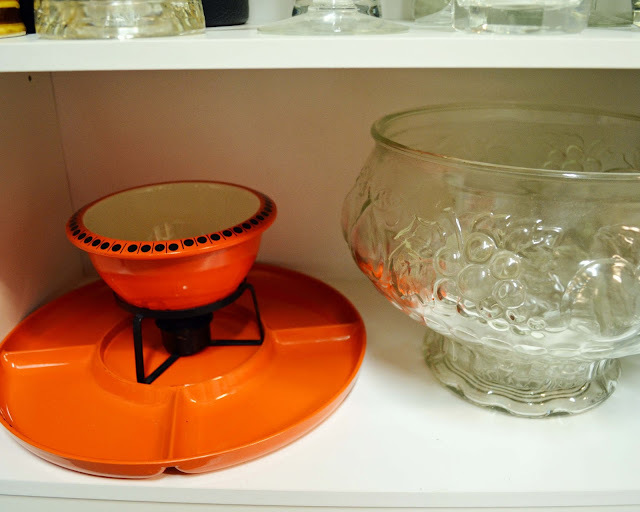 So, I put larger dishes on top of the pantry cupboards. I chose colourful ones so it would look pretty. Desperate for more space, I turned to the corner lazy Susan cupboard. In addition to all of the pieces of our Magic Bullet, it now holds teapots and these flower power dishes that Jill gave me. This cupboard is right under the Keurig coffee brewer, so it's easy to grab a cup. My wedding china, my grandmother's china and some other pieces I have collected are housed in the dining room armoire. It doesn't end there. 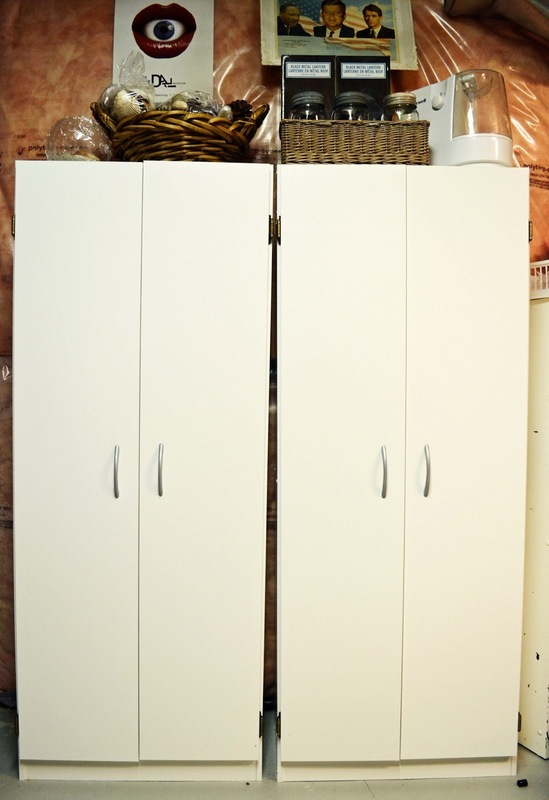 I asked my husband to pick up these two inexpensive cupboards at Canadian Tire one day. We put them in our (large) basement storage room. Note the picture of three American leaders propped on the top of one cupboard. I'm not sure why my (Canadian) parents owned this, but it was always in our basement growing up, and now it's in my basement. I always get teary-eyed when I'm reminded of Martin Luther King's "I Have a Dream" speech. 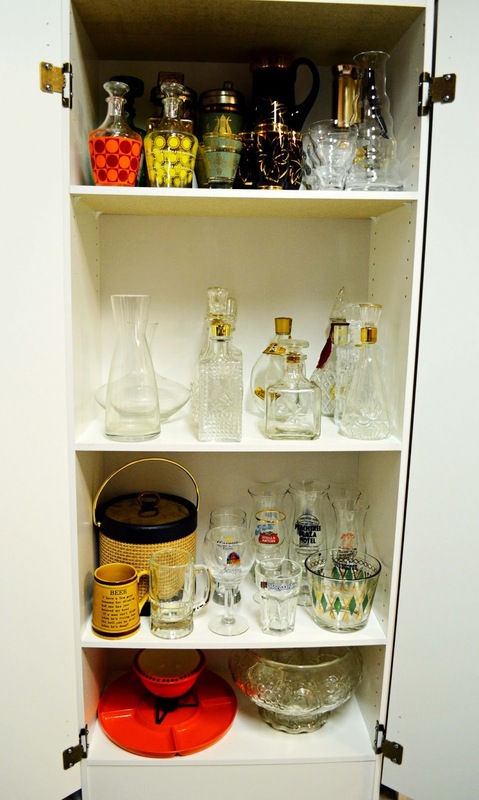 The cupboard on the left holds glassware for entertaining (read drinking). Most of it is from my mom and dad, although I have added to the collection myself. We don't use these pieces often, so the basement is a suitable place for them. 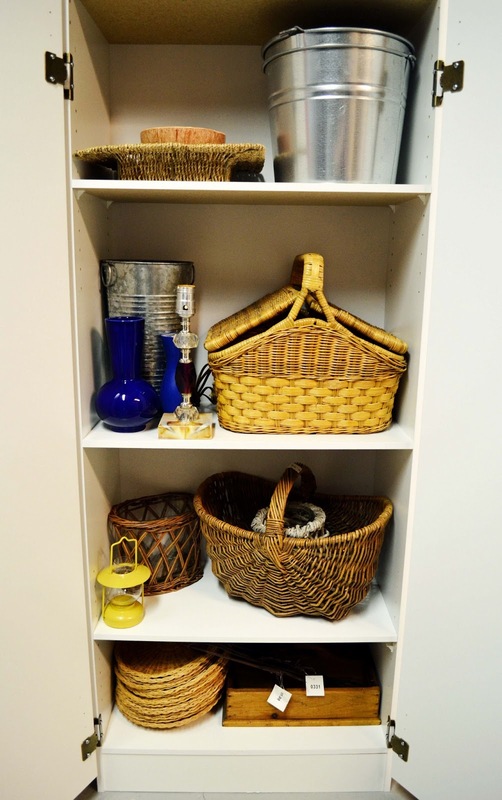 The other unit holds basket ware and a few assorted pieces (like that lamp that I'll probably never get in working order). Of course, I just attended my favourite annual basket sale, so I have an additional pile of baskets sitting in my front hall as I write. Because my collection keeps on growing, I dream of a giant china cabinet for the other side of my dining room. So far, the ones that I like are just too expensive. What about you? How do you store your favourite collectables? I think my house is telling me the same thing, Wendy! One thing that helped my storage issues. Add extra shelves to every existing cabinet I owned. For example I would add three more shelves to the dining room cabinet. 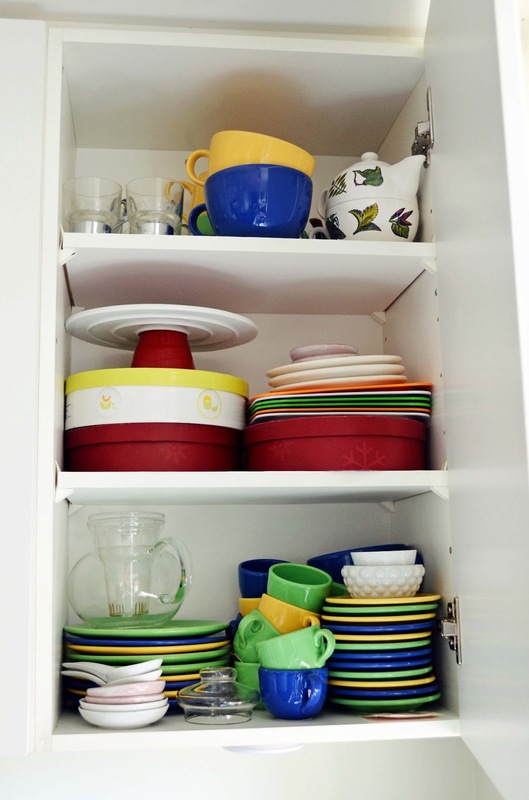 Reserve one shelf for your really tall items and then space the other shelves out evenly. When I did this I gained more storage, it really cut down on breaking items ( I used to stack things like crazy) and I found I use pretty things more often because access is easier. You are so right. 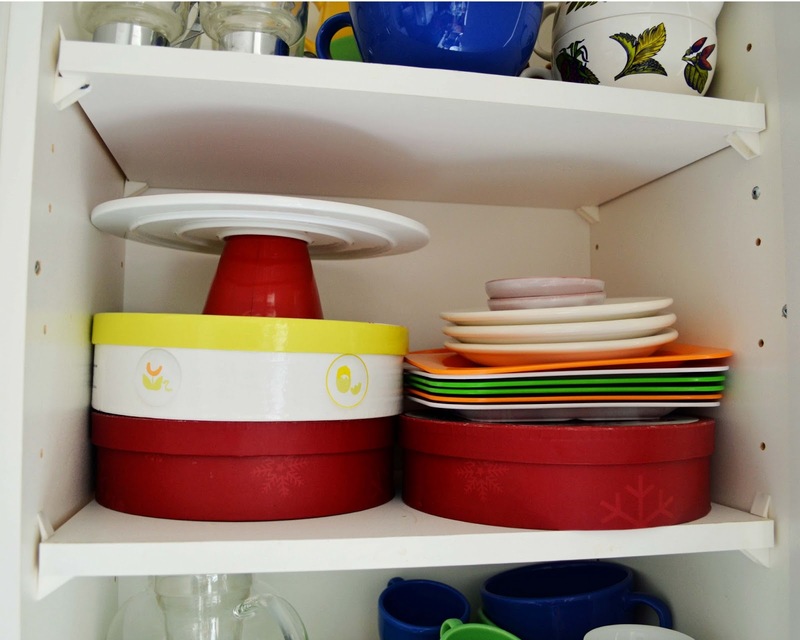 Stacking isn't good for the dishes, and sometimes I don't feel like taking them out to use because it's a pain to move them all around. You can even pick up the individual extra shelves at tag sales. 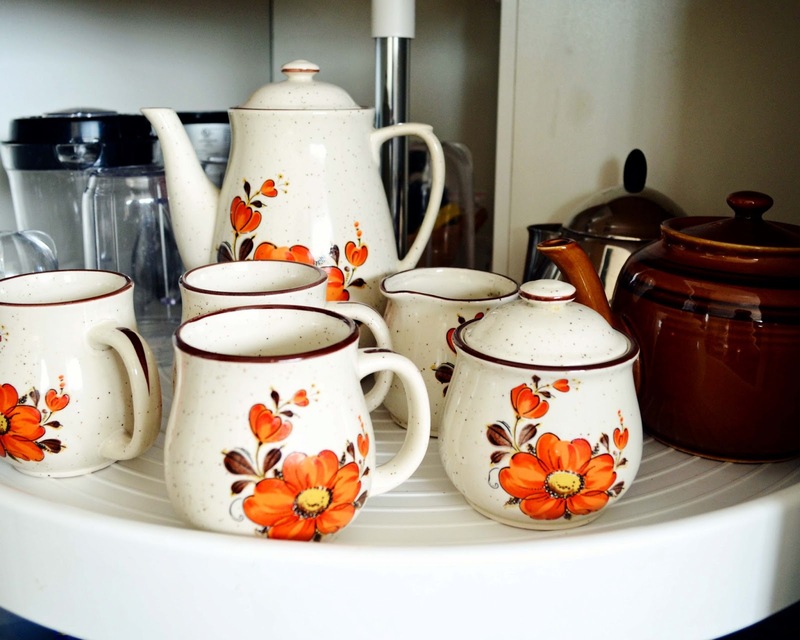 Often times people dismantle cabinets and have the shelves for sale or even better in a free pile. Thanks! I will look out for them. Joann: Remember the floor to ceiling bookcase your dad built at the inside end of your large clothes closet You were only little but it sure came in handy. I remember my "hidden" bookcase Mom. I had to push clothes aside to get to it, but I loved it. I didn't know Dad built it though. 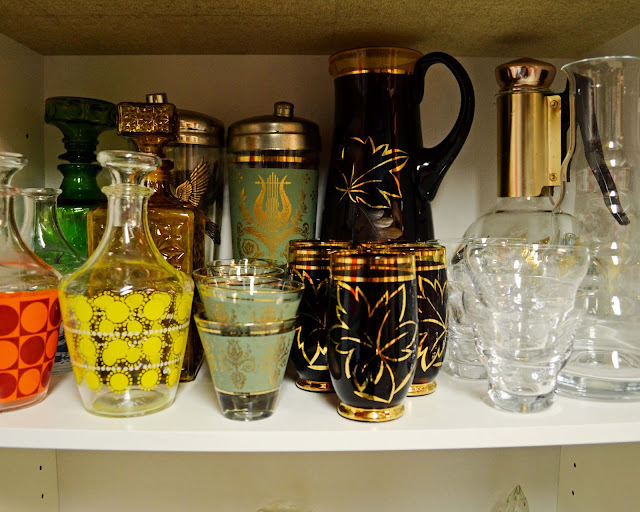 Thanks for sharing; as a fellow collector, I find it fascinating to see where/how others store their collections. 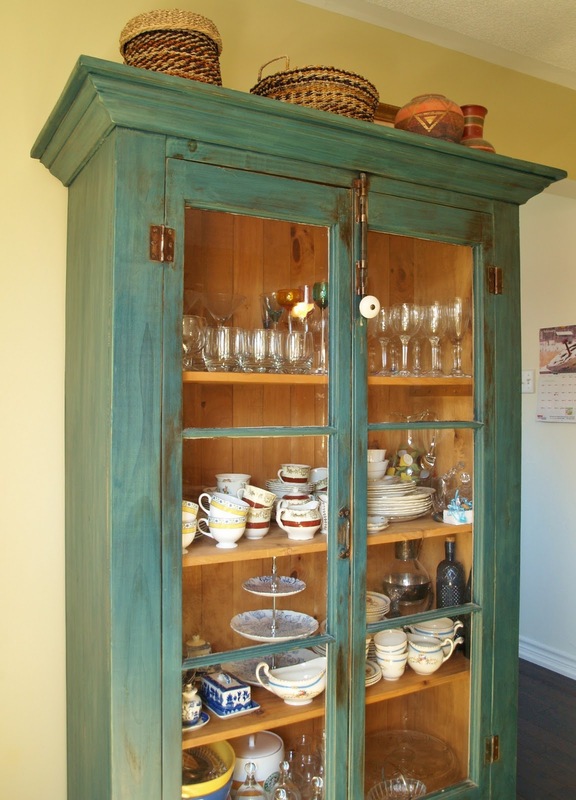 I like that basement cabinet idea! 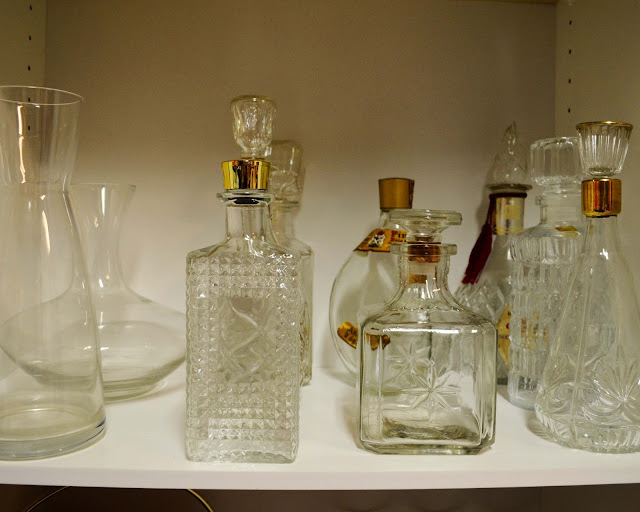 Your barware and decanter collection is, by the way, amazing! I like to see how other people store things too. Wow, that's a lot of dishes! You're very organized though, which is good. I'm sort if the opposite because I do like to purge everything including dishes... but James holds on. I can deal as long as there's a space for everything :) Beautiful collection. 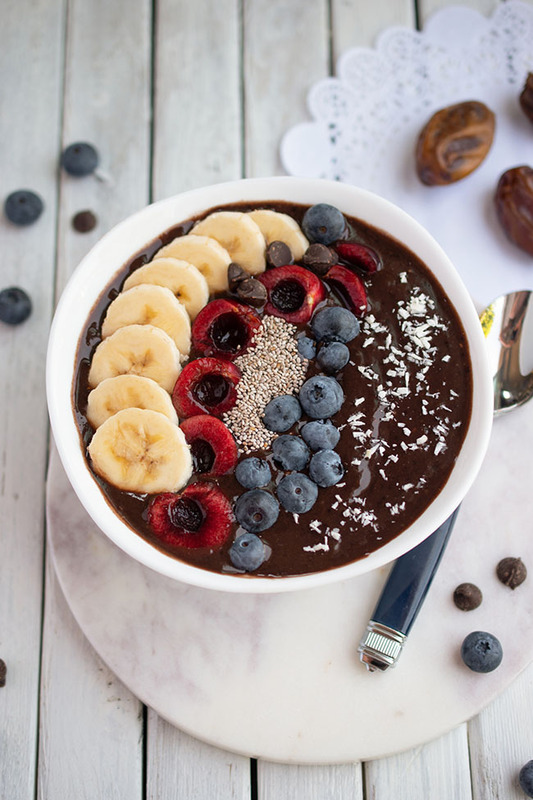 I started reading this post and I didn't realize it was you with all these dishes!! Hah!! You do have a few!! 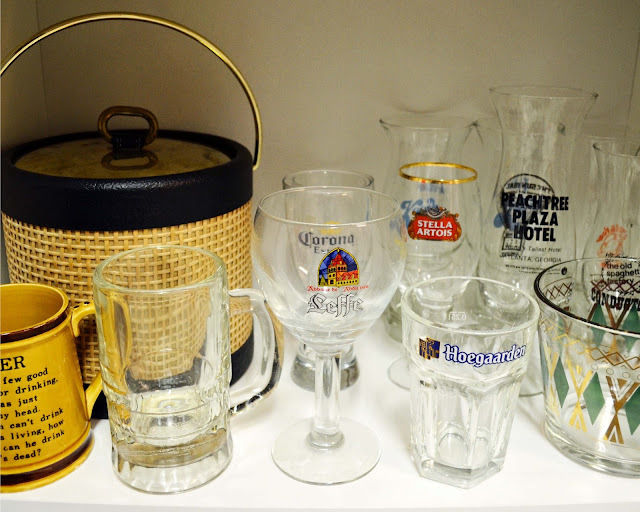 I see some of the same beer glasses that we have, my husband has a whole shelf of them, why I don't know but I do know they cut down on my space!! 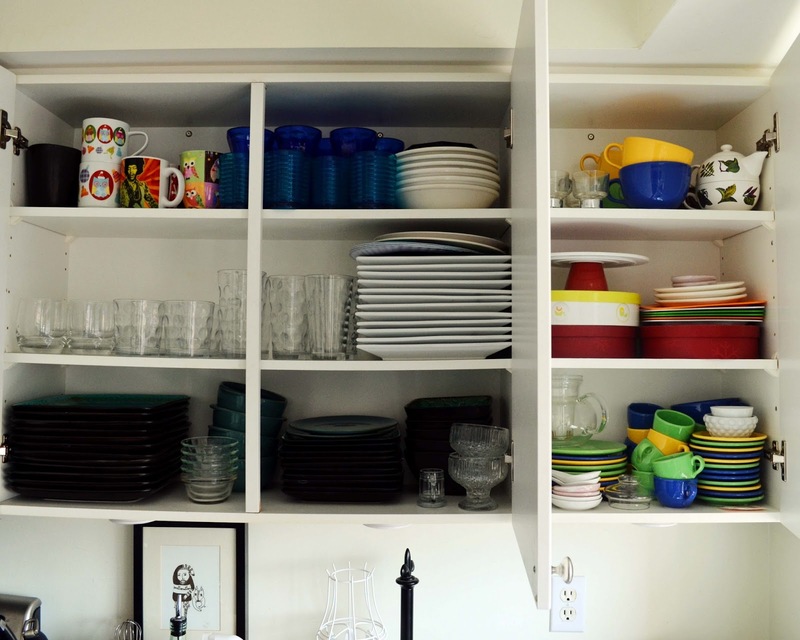 Technically, you could have the hugest party imaginable and not run out of dishes. What clever ways and means you've found of storing them. Reminding me of my mother in law...sometimes, I just open cupboards and closets at her house and revel in the order and sense. A beautiful thing. Now I just have to organize all of the upstairs closets...and the basement! That's a lot of purging! Good for you. Must have been very satisfying. I should really do the same! i love love love the Pictures <3 ,all looks so beautiful! I sell them--I keep the ones I NEED the rest are funding my trips around the word ok ok just southwest america this year but STILL I can haz dreamz? I'm like you, I have dishes and glassware stored everywhere! Now that I'm moving to a smaller space I have to downsize. Hard? Yes! Impossible? NO, sometimes ya gotta do what ya gotta do! Thanks for joining us at TTF this week. Boy, you definitely have lots! I'm being sly by passing some things on to my son and daughter!! But that doesn't make much of a dent! I love your dishes on top of the cabinets! Lack of storage and space is always my enemy! You have some really fun pieces in your stash! Thank you for sharing at TTF this past week!